Affiliates in Podiatry has three convenient locations to serve your needs. 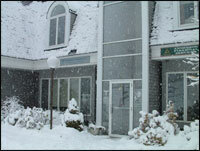 Our main office in Concord is located on the campus of Concord Hospital. Our New London office is located on the campus of New London Hospital. Our Meredith location is on Route 3 in the Meredith Square Professional Building (Fitness Edge Building). All our offices are equipped with state-of-the-art podiatric technology to meet your clinical needs. We know you have many choices when choosing a Podiatrist in Meredith, NH, so we have made requesting an appointment a simple process via our Web site. If, for any reason, you cannot keep a scheduled appointment or will be delayed, please call as soon as possible. Charges may be incurred for appointments cancelled less than 24 hours before scheduled appointment time.